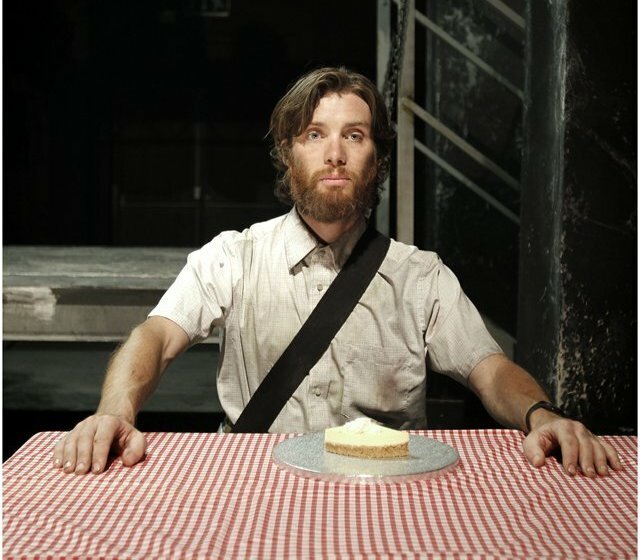 Watching Cillian Murphy’s Thomas Magil, Inishfree’s one-man self-appointed morality committee, in Enda Walsh’s Misterman, I found myself transported back to two days previously to the Barbican where Cate Blanchett was the actor and Boho Strauss the playwright. The parallels, as both plays hit London in the run-up to the Cultural Olympiad, perhaps reveal more about the process of staging a difficult play in the current climate than they reveal about the plays themselves. The heavily-advertised cherry on top of each production is a bona fide Hollywood actor but not in the classic star mould that so often has the critics sharpening their knives. Both began their career in another country and grew up with one foot in the theatre rather than the Hollywood Hills. Neither has fully embraced the movie system despite Blanchett winning an Oscar for her role as Katharine Hepburn in Scorsese’s The Aviator; as close to embodying Hollywood royalty as it gets. Murphy has never embraced his potential leading man status whilst building a body of work that includes the huge Christopher Nolan blockbusters of the Dark Knight and Inception. It is intriguing that in their return to stage both have chosen roles that focus almost exclusively on the isolation of the leading characters. Blanchett’s Lotte is a woman cast adrift from society following the break-up of her marriage; she is unable to effectively anchor herself and drifts along engaging in surreal encounters with friends and families that only heighten her growing isolation. On the surface Murphy’s Thomas is suffering from an imposed isolation. He is literally rather than metaphorically alone; forced into making conversation with tape-recorded voices. However even in these interactions it is clear that Thomas was always out of kilter with those around him. It is a fantastical set-up but there is realism within the structure of the conversations that sets it apart from Big and Small. It is difficult not to speculate what led the actors to these roles. They are not well-known plays and it seems unlikely that either would enjoy the same positioning and budget without their leads. The roles allow a freedom to an actor that is rarely granted, even in the theatre, but under the surface they are also strangely inflexible and a little one-note. As neither play really sketches out anything more than a caricature of secondary characters, the actors have no-one to play off and at times it can feel like an intense therapy session. This highlights a fundamental flaw in both productions; the complete centrality of two well-known actors in these roles cannot help but draw attention away from the relative merits of the play as a whole. It is possible to revel in two stunning performances, and both carry of each role with aplomb, but come away with no real insight into the play. Both plays become shaped by the focus on the actor, rather than the actor using his position to focus action on the play. Blanchett is so big, so wonderfully unrestrained that it is has the impact of making it impossible to keep track of the journey, and Lotte’s voice gets lost along the way. A similar problem happens with Murphy, who is given the added challenges of a spectacular, and spectacularly vast, set and a multitude of characters to play. One becomes absorbed in the technical challenge of the role rather the content of the play. There is no inherent problem with having ‘film’ actors in the theatre, and lets not forget that Murphy began his career as an acclaimed stage actor and Blanchett is the current co-artistic director of the Sydney Theatre Company, but there is an issue when their profile causes them to dominate the play rather than be its equal. Returning to the play at hand, Enda Walsh’s Misterman is a revised version of a 1999 production. It transforms the Littleton stage into a vast warehouse, removing the back wall so the action stretches almost as far as the eye can see. It is a stunning use of a familiar space and has the effect of catapulting the audience out of the theatre and into the play. It lays down a gauntlet to the actor and the script, as both have to match the visual impact of the surroundings. The play begins by making full use of the space, Murphy’s Thomas Magil races around the stage as Doris Day plays in the background. Thomas exists in this place, surrounded by tapes relaying conversations with the people of Inishfree. Time and space are not referred to but it becomes evident that Thomas is reflecting on a past event. There are clear echoes of Beckett’s masterful Krapp’s Last Tape in the use of tapes as a mechanism to allow the present to interrogate the past. Walsh moves past this by dipping into the rich tradition of Irish verbal story-telling and by allowing Thomas to physically embody his characters in words and action. It is a difficult skill and Murphy is mostly successful in bringing his characters to live. Highlighting his strangely androgynous quality, the most successful of these transformations is in the form of a sexually-charged woman owning a café. There is always a concern that when it doesn’t work the results will be farcical and at one crucial moment in the play, involving Murphy and a dog in the village, the interaction does veer into the comical. However there are deep problems with the play as a whole – for however much the set is a magnificent construction, the set-pieces of the taped recordings are well thought-out and Cillian Murphy’s performance is a masterclass of magnetism and verbal flexibility – the underlying narrative flow is far too obvious. It is unclear whether Walsh intends the ending of the play to be a climax, it is certainly directed that way, but the reality is that it is something of a damp squib. The major revelations have been signposted from a long way out by an audience culturally aware of novels like We Need To Talk About Kevin, Vernon God Little or even The Wasp Factory. Audiences are hard-wired to be cautious of alienated, off-kilter loners with a dead-father and an overly close relationship with their mother, and have been since the creation of Hamlet. It is particularly disappointing given the sparkling history of Irish playwrights working in similar fields; Marie Jones’ smash-hit Stones in His Pockets, a two actors playing fifteen parts and balancing on the tightrope between comedy and pathos. Martin McDonagh’s Beauty Queen of Leenane is a masterclass in the art of the delayed-release in story-telling and from a very different perspective covers similar ground. In comparison to these plays Enda Walsh’s play feels rather lightweight and all the additional help given by the set design and the performances unfortunately can’t save it.